this product does what it's meant to do. Holds generic HH Shower. Can be moved . Easier 2 reach. For cleaning. Holds best if you clean soap scum off tile before applying. 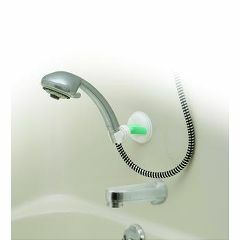 Great to put at chest height on shower wall to make it easier to use while bathing standing up, or you can easily move it lower if bathing seated or lying in tub, or for using to rinse while cleaning a tub. Remarkable product. Does the shower holder Holds as suction cup or a Stick-on? Asked on Jun 26, 2014 10:45:47 AM by Henry from Tempe AZ.